We are a premier enterprise, specialized in manufacturing, exporting and supplying of a vast range of Air clean equipment to our valued patrons across the domestic markets. Our broad assortment of products encompasses Cellulose Pads, Spot Humidifier, Air diffuser, Cooling fan, Air humidifier, Air washer plants, Centrifugal fans, Axial flow fan, Semi central unit, Volume control damper, Di eliminators, Diffuser, PVC eliminators, Plastic diffuser, Plastic grills, Spray nozzles, Rotary air filter, Rotary water filter and Air handling unit. Through taking up efficient manufacturing processes, we could establish a strong foundation in this industry domain. Our market leadership in the field of Air clean equipments is due to the untiring focus on innovation and modification based on the shifting market trends as well as preferences of our customers. Our team of professionals possesses the necessary expertise and experience to address the requirements of clients in a time bound manner. 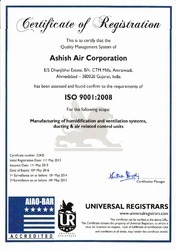 Our company Ashish Air corporation was incepted in the year 1985 and has been able to develop a unique position in this industry within a span of more than two decades of our existence in this industry. Leveraging on a highly expert, experienced and qualified team of professionals in our team, our heartening growth in this domain of manufacture is due to our high ideals, quality of services. Through offering a wide spectrum of products, we have been able to attain a prominent place among our competitors. We have been constantly guided by our General Manager Mr. Ashish Patel in the manufacturing processes our wide array of Air clean equipment. His extensive expertise in field of manufacturing and marketing of our range for more than two decades is an inspiration to our company in extending the high quality range to our clients in a sustained manner and stay ahead of our competitors in this industry domain. Manufacturing, Trading, Importer AND Exporter of HVAC Equipments. Our company has employed a team of professionals like Technicians, Designers, Marketing staff and warehousing & packaging personnel that possesses vast expertise and experience to lead the organization to the peak of success. Our team strives hard towards meeting the client satisfaction through offering our immaculate range of products. We have deployed a team of quality controllers that checks and closely monitor the quality of products, prior to delivery and our warehouse staff handles the affairs of storage and delivery of products.